After Mural Restoration in California The Horse Breakers by Fletcher Martin is again in Lamesa, TX! A valuable Depression Era oil-on-canvas-glued-to-a-wall mural called “The Horse Breakers” by renown artist Fletcher Martin, painted way back in 1939, is back in it’s original community of Lamesa, TX after it was removed from a wall in a building slated for demolition and sent for restoration to a professional art conservation lab in Santa Barbara, California. Most people in Lamesa didn’t even know about the notable painting, although its been present on the same wall where it was originally placed since 1939. I guess you had to be a real “ol’ timer” to remember it. 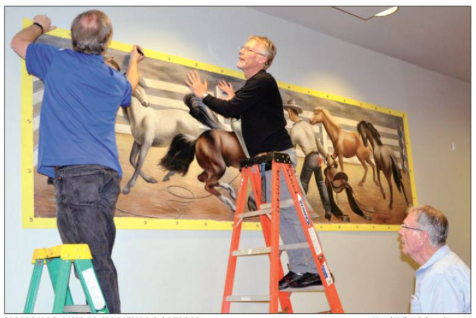 But The Horse Breakers broke into the news when it was reported in several media outlets to have been taken away for mural restoration last September 2015. People were unaware that such a mural existed! This is mainly because the building where this mural was located has been vacant for more than the past two decades and it had not been in public view for the past 30 years. Back then, the building was a federal post office building, which was owned by the Lamesa Independent School District. But as the building was not utilized, this mural was hidden from public view. It was probably a good thing too, given the value. Recently, there was a study to rehab the old federal building and the price tag was way more than the building is worth or could be justified. Therefore as the idea of demolition began to be discussed, a local resident named Randy Leonard took an interest in the mural located in the building in question, and along with other local businessmen, got in touch with the Weaver Foundation for granting funds to save the mural and undertake the mural conservation process. After the art restoration was completed, the WPA (Works Progress Administration) art was put up on the north wall of the Forest Community Park Center’s main meeting area. The Horse Breakers will officially be unveiled in a formal ceremony which is planned for next month during the Original Chicken Fried Steak Festival to be conducted in Lamesa, TX. The Horse Breakers was painted by Fletcher Martin, an artist during the Great Depression Era that painted murals in locations stretching from Southern California to New York City. He painted some very iconic images that reflect the Depression Era and the times leading up to WWII. It was originally financed as a Works Progress Administration (WPA) art contract, placed in the new US Post Office built in Lamesa back in 1939. Along with the restored mural, more details about Fletcher Martin and the creation of the mural along with recognition of Weaver Foundation for the financial help towards the painting’s restoration will be placed near the wall. 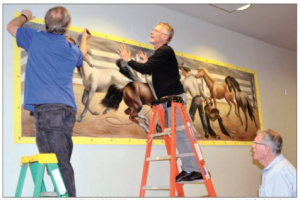 The Conservator of Fine Art and the owner of Fine Art Conservation Laboratories based in Santa Barbara, California, Scott M. Haskins, personally went to Lamesa several times to help plan the project, remove the mural and, this last time, to install the mural on the wall in the community center after it was shipped back from California. Thanks to the efforts of Mr. Randy Leonard the mural is now restored and a piece of Lamesa’s history and a valuable work of art has now been saved from being forgotten and damaged and will be appreciated for generations to come. “Like” this page now and leave a comment, please! It helps this article and website show up in the search engines for other people to find answers to their questions. Seen in the photo are Mr. Scott M. Haskins, Mr. Richard Leonard and Mr. Randy Leonard discussing about the installation of the mural at the Forest Community Park Center in Lamesa, TX. Mr. Haskins has been working with small communities through out his 40 year career as an art conservator and mural restorer to help save and preserve murals. He has worked on similar projects in 8 different old WPA post offices in Pennsylvania, Atlanta Georgia, Alamagordo New Mexico, several in California and Utah, Eugene Oregon, Cedar Rapids Iowa, and, of note, on the monumental murals in Fair Park, Dallas Texas. If you would like to know more about what you can do to protect and preserve your original family history items, collectibles and memorabilia click on this link for a free copy of Scott M. Haskins book Save Your Stuff – Collection Care Tips, 210 pages with 35 embedded how-to videos. And CLICK HERE for FACL’s YouTube channel – Subscribe! This entry was posted in Consultations, Historic Buildings - Construction Sites, In Lab, Murals, Travel and tagged mural restoration. Bookmark the permalink. 20 Responses to After Mural Restoration in California The Horse Breakers by Fletcher Martin is again in Lamesa, TX! That is a really neat piece of art and one from so long ago. When I read about art that is being conserved, or saved in a situation like this, it makes me feel good that there are still people out there that can appreciate it. 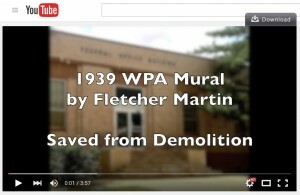 I love WPA art and this is a great example of professional art conservation. Thanks John. It looks really great in the community center, don’t you think? Thanks for your comment. Thanks to all who were involved with this project in Lamesa. It was a very good group to work with. Thanks for leaving your nice comment Dama. We enjoyed working with you on your projects. Just like you, they reached on the internet and found my past projects. They checked around and made a few calls and found that “The A Team” was willing to come and work with them. Thanks for your comment. I agree Guest, the Weaver Foundation did a great thing for this community and they feel the money was very well spent. Thanks Shaun for your comment. Thank you Belva. Glad you found the video interesting. Stay in touch! Thanks Libby for leaving your nice comment. The subject matter of this Western mural is perfect for our community center. Thanks for your great painting conservation work. Thanks for making the video on the whole process. Very nicely done. Good video of the step by step process of the mural restoration. Thanks to the Weaver Foundation for financing the effort. This is the only piece of public art in our county! We feel lucky to have such a valuable painting from a famous artist. Whoa, Lamesa is out in the middle of nowhere. How did you get someone professional to come and do this for you? Great prices and equally great customer service. I’m a repeat customer. And happy! Its kind of funny that a renown artist like Fletcher Martin would do a mural job in Lamesa. I guess times were tough. Scott Haskins made this an easy job to get accomplished as he was very accommodating and worked well with all the people involved. The mural looks so fresh and vibrant. We feel lucky to have found Scott Haskins and his art restoration company. I am so glad this mural was saved! Thanks to all in our community that made this happen!